Testing and creating new recipes is a passion of mine, a passion born of growing up as a picky eater, and learning to cook food that I enjoyed since my Mom had no plans to become a short order cook. I’ve had multiple successes and failures in the kitchen, but for the most part the meals I create are enjoyed by both family and friends. And since stumbling upon what I call the JERF movement (just eat real food), I strive to incorporate real, whole, unprocessed foods into my diet as much as possible. But, please don’t think my diet is bland and boring. Trust me, I don’t sit around eating steamed veggies and dry chicken every day, although I wish I could sit around eating bacon all day (but that’s just a wish my heart makes). I want the meals I create to be both visually exciting and full of flavor. One recipe in particular, involving date balls, gets rave reviews every time I whip a batch of these treats to share. 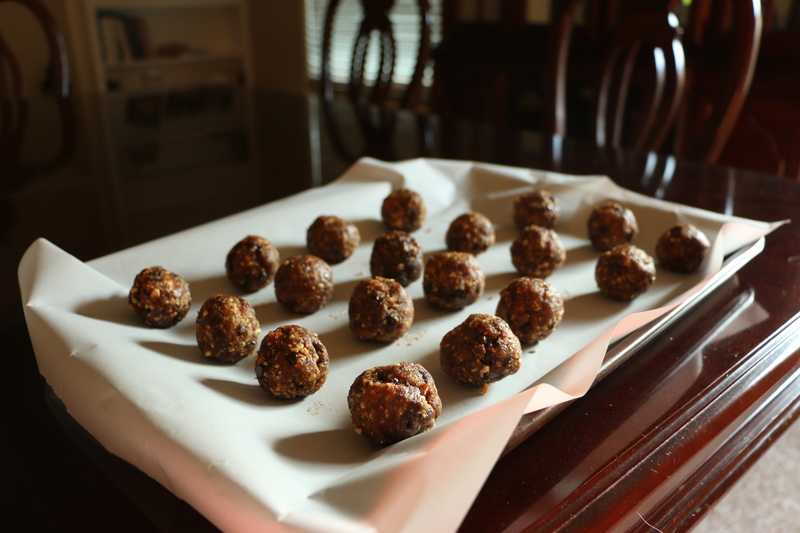 There are many date ball recipes floating around on the internet, and I am excited to add my own personal spin to on the standard date balls to the mix. These date balls include the following ingredients: dry roasted almonds, mejool dates, unsweetened shredded coconut, enjoy life chocolate chips, cocao nibs, vanilla extract, orange extract, sea salt, coconut oil, and Barney’s chocolate almond butter. These treats are easy to make and fun to share. If you create this recipe, I would love to hear what you think of them! Process almonds in a food processor until they look like crumbs (don’t process too long or it will turn into almond butter). Empty almond crumbs into a separate bowl. Process the medjool dates until they are sticky and in small pieces. It may form a ball in the food processor. You’ll want to break this ball apart before the next step. Once you have processed the medjool dates, add back into the food processor the almond crumbs. Then add in 1/2 a cup of unsweetened shredded coconut, vanilla extract, orange extract, orange zest, sea salt and chocolate almond butter. Process the ingredients in the food processor until it looks like the ingredients start to stick together. If the mixture is still crumbly, add more medjool dates, 2 or 3 at a time, until the mixture becomes sticky and you can form the dough into balls. Once the dough is ready, add the chocolate chips and use the pulse feature on your food processor until the chocolate chips have been incorporated into the mixture. Form the dough into balls using 1 or 2 tbs for each ball (depending on how big you want them to be) and place the balls on a baking sheet lined with parchment paper. 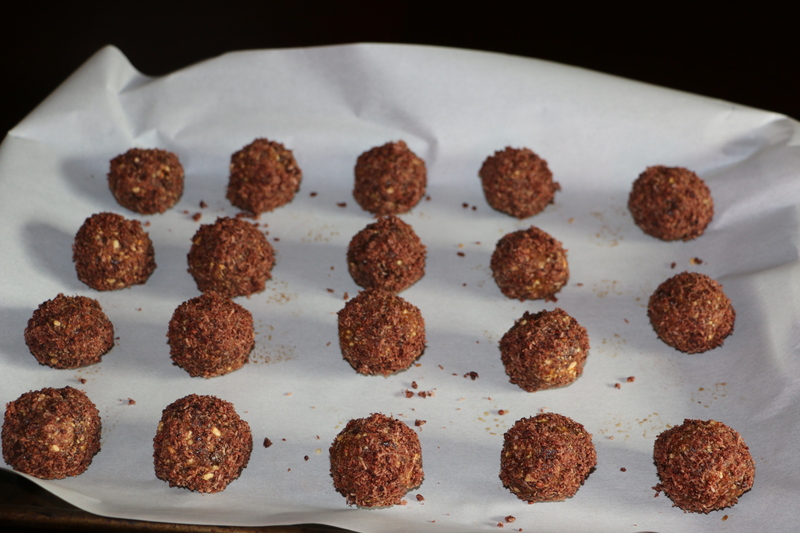 Once you have finished forming the balls, add the remaining1/2 cup of shredded coconut and ¼ cup cacao nibs in the food process and process for 20-25 seconds. 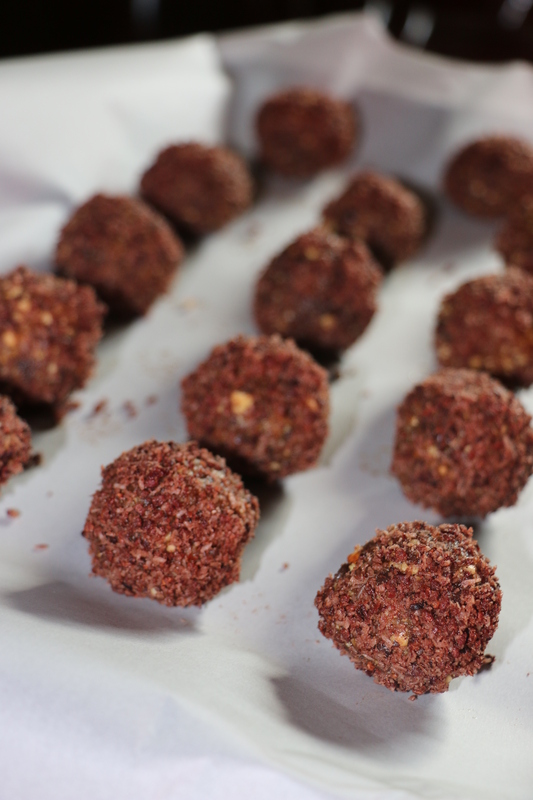 Lay out the shredded coconut/cacao nib mixture onto a plate and roll each date ball in the mixture. Once each date ball has been coated, place them back on the parchment paper. Repeat this step as necessary until you have used up all of the date ball mixture and coating. Refrigerate the date balls for 30 minutes or until you are ready to serve them (you can also freeze them, although you may want to defrost for 10 to 15 minutes before serving). If you can’t find dry roasted unsalted almonds, you can roast 1 cup of raw almonds at 350 degrees for 10-12 minutes. Let the almonds cool for about 10 minutes before moving on to the next step of the recipe. If you have difficulty finding Barney’s chocolate almond butter, you can substitute with regular almond butter, or any other kind of nut butter you may prefer. You can substitute cocoa butter for cacao nibs. This recipe is great even without the orange extract/orange zest if you would prefer not to add it. 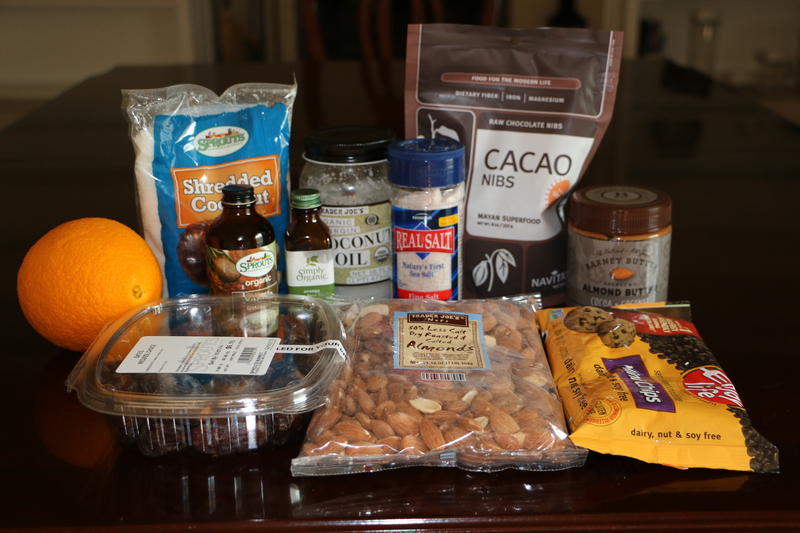 Tags: chocolate, date balls, Gluten-Free, grain-free, paleo, snacks, vegan, vegetarian | Permalink.